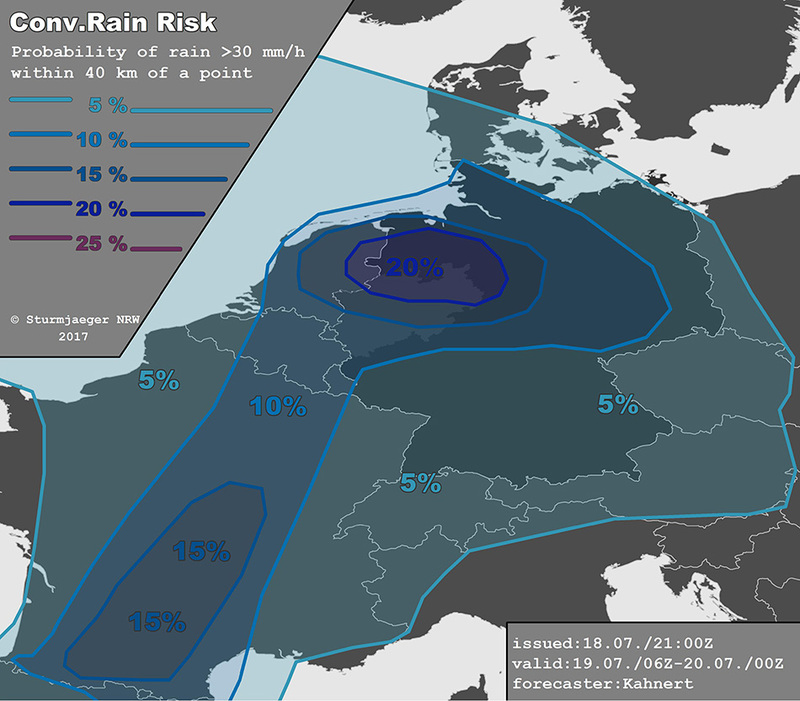 Das zweite Severe Threat 2 betrifft Südfrankreich. Wer hier in Urlaub ist, hat ab den späteren Abendstunden mit Gewittern mit Unwetterpotential durch Hagel und Starkregen zu rechnen. Seasonably typical weak flow pattern influences the European continent. A cut off low over the north Atlantic slowly moves southwards while a weakening trough over E Scandinavia/NW Russia stays in place during the forecast period. In between these features, ridging coincides with a strong meridional warm air current up towards the Polar Circle (10 °C Isotherm reaches Iceland on Wednesday). At lower levels, a warm front that is associated with a poorly defined sfc low over GB, shifts northwards across France, inducing elevated convection over the British Isles in the next hours. The warm front denotes the leading edge of a spanish plume in which DMC gets likely tomorrow from S France to N Germany. South to the warm front, a sfc convergence is likely to devolop in the early afternoon hours over the southern Severe Threat 2 extending from NW to SE. Moisture pooling along the convergence and evapotranspiration will cause the specific moisture to increase up to 15 g/kg. With an EML above the moist sfc layer, ML CAPE is forecast to reach 2 kJ/kg with even higher values possible depending on the actual insolation. With northwards increasing DLS between 10 and 20 m/s and 0-3 km SRH of maximally 300 J/kg next to the warm front an explosive set-up is likely over the highlighted area. Nevertheless some uncertainties arise, as CI is forecasted differently by the NWP guidance. 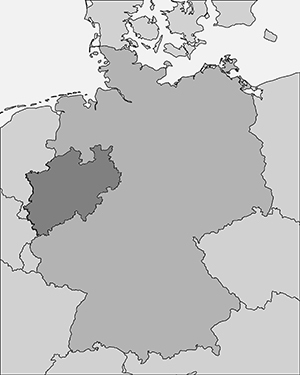 The strongest outlier is represented by the EURO 4 12 Z which puts the emphasis to mid North-Rhine-Westphalia (and eastwards) rather than to the NW Germany like other models (e.g. WRF4km, ECMWF). Current thinking is that a strong WAA – generated cap should suppress most DMC until the afternoon. A few earlier developing elevated or high based cells, however, cannot be excluded in association with the local WAA maximum (= synoptic scale lift) over W Germany/Be-Ne-Lux. We currently go with WRF 4km and expect CI over E NL between 12 and 15 Z slowly shifting eastwards to NW Germany. The more northern the cells initiate, the greater will be the chance for them to benefit from the aforementioned SRH and become supercells. WRF 4km for example predicts a right mover over north-German plains in the evening. Other models show a more MCS-like storm mode, which is also an imaginable scenario as MCSs preferably develop south to a warm front. 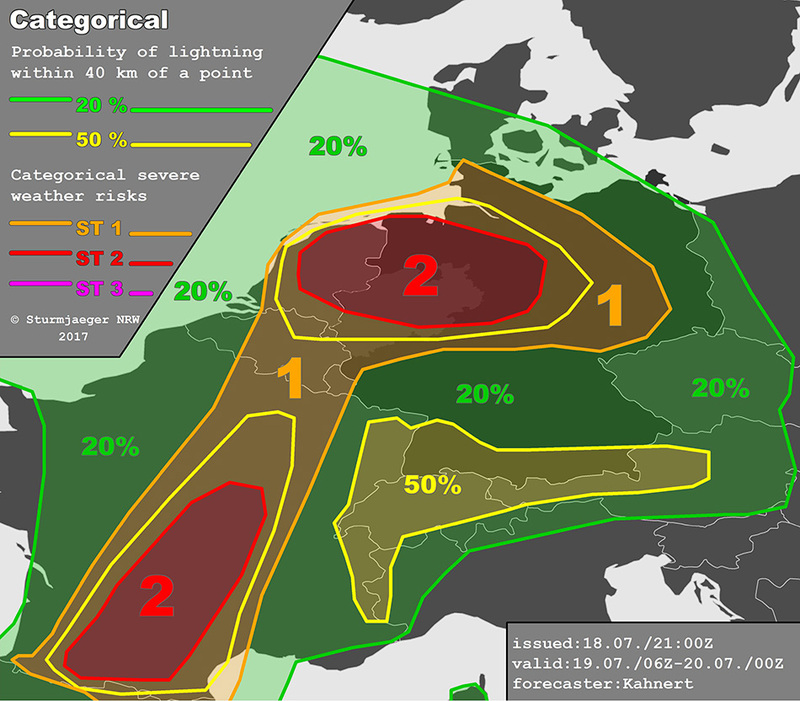 Excessive rain (notice the 20% area) and large hail up to 5 cm in diameter will be the main threats, followed by a severe wind gusts (especially if a MCS evolves). We also introduced a 5 % tornado line where the moisture convergence is most likely to overlap with the enhanced SRH values in the early evening. East to the meridionally orientated flow-parallel cold front, a theta_e maximum is forecast to arise north to the Pyrenees beneath the northbound advected EML. Additional moisture pooling and slight lee cyclogenesis will result in late and high-based CI (around 18 Z). With 0-6 km DLS around 20 m/s and straight hodographs several split storms may form from Toulouse to the Massif Central. The main threats will be large hail and excessive convective precipitation. More to the north (E-CRTL France), storms may also initiate but due to weaker ML lapse rates and kinematics a Severe Threat 2 is not justified here. Several weakly forced storms are forecast, but due to low PW-values (up to 25 kg/m²) and weak CAPE-shear a Severe Threat is not issued. Nevertheless an isolated severe event due to large hail / excessive convective precipitation cannot be excluded.